Handy ITIL Exam Timer (It’s free!) 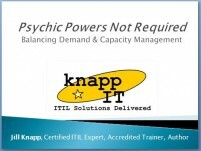 « Knapp I.T. In this handy Excel spreadsheet, simply enter the exam start-time in the obvious box, and through the magic of Excel, the other boxes will automagically populate with the countdown times. This tool works for all ITIL exams, from Foundation, Practitioner, all the way through the Intermediate exams. If you like it, just click here to download it.